Introduction and Transcription by Anthony T. Grafton and Urs B. Leu. The humanists of the fifteenth and sixteenth centuries took a passionate interest in Livy’s History of Rome. 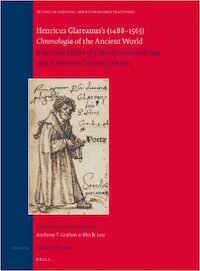 No one studied the text more intensively than the Swiss scholar Henricus Glareanus, who not only held lectures on different Roman historians at the University of Freiburg im Breisgau, but also drew up chronological tables for ancient history, which were printed several times in Basle, sometimes together with Livy’s History. Glareanus annotated his personal copy of the chronological tables and invited his students to copy his marginal notes into their own copies of the book. Three of these copies survived, and give new insight into Glareanus’s practices as a scholar and teacher. The notes they contain—and the way in which Glareanus used them as a teacher—are distinctive, and neither has had much attention in the past from historians of reading. This volume presents facsimile reproductions of the tables from one of the surviving copies, now kept in Princeton University Library. The high-quality reproductions include transcriptions of the handwritten notes, unlocking Glareanus’s teachings for a new generation of students and researchers.